Your child will learn foundations of movement without even realizing it. These foundations are taught by Veronica Edwards who is not only a dancer but is trained to TEACH dance in ways that are age appropriate. This difference is important because she understands what is correct for young minds and young bodies. Melody Movement also introduces children to other fundamental curriculum learning skills such as counting, color and shape recognition, vocabulary and language skills. The strength of the system is that learning is achieved through imaginative movement which is enjoyable and fun. 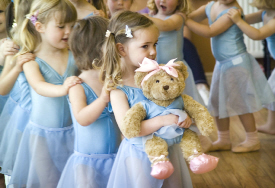 More than just another toddler’s dance class, Melody Movement is the only class in the region taught by a certified Royal Academy of Dance (RAD) instructor, Veronica Edwards. Only RAD instructors are able to license Melody Movement without additional extensive training. The quality of the program is assured in this way. You can be confident in the teaching of Melody Movement, and watch your child have fun through the viewing window during class!